V.W. Bro. William Thomas Braithwaite, 18°. Extract from “History of Masonic Hall, Arthur Square, Belfast” by Samuel Leighton, 1927. V.W. Bro. W. T. Braithwaite, 18°, P.M.W.S. Chapter 12, P.P.S.G. Warden, Antrim. P.M., P.K., P.P. of Temple Lodge, Royal Arch Chapter and Preceptory. Died 22nd January, 1918. 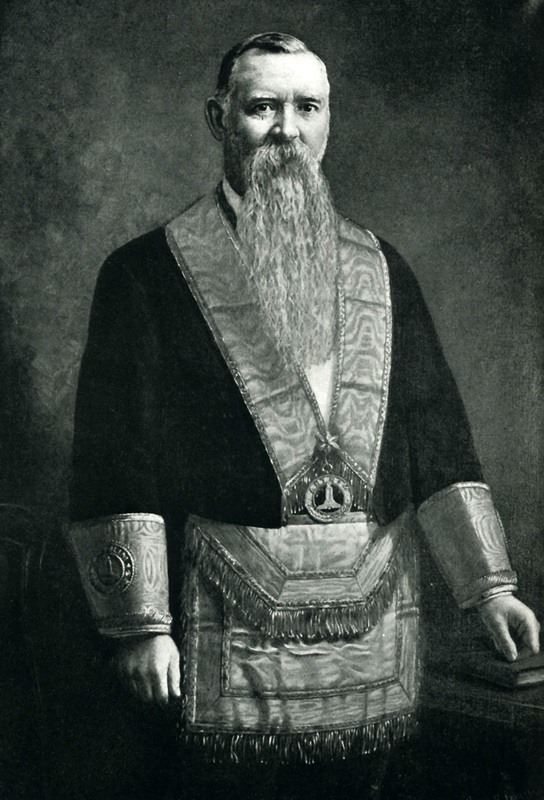 This portrait was unveiled by R.W.Bro. Jas. H. Stirling, 30°, Deputy Provincial Grand Master, Antrim, at the Stated Meeting of the Provincial Grand Lodge. 10th May, 1920. V.W. Bro. Braithwaite, 18°, familarly known to his brethren as ” W.T.B.,” was greatly esteemed by everyone who had the pleasure of knowing him. He was of a most retiring disposition, and it was with difficulty he was persuaded to accept Provincial Grand rank; even then he would have been better pleased with a more humble position than that of Senior Grand Warden, but his brethren decided that the highest office in their gift was the one for him. Subsequently, he was exalted to the degree of “Prince of the Grand Rose Croix,” Chapter 12 of which he was P.M.W. Sovereign. His interest in the Order, and especially in the Charities, was remarkable for sincerity and service, and his unparalleled generosity was manifested in the munificence of his legacies. He was a distinguished sportsman and a famous rifle shot, having earned for himself the cognomen of ” Bull’s Eye Braithwaite ” from the accuracy with which he found the centre of the target. His hospitality was proverbial, and his friendship warm and sincere. In public life he sat as a Water Commissioner, and it was only his own desire which prevented his receiving other honours of a like nature. He is buried in the Shankill Graveyard and is the first grave as you enter by the lower gate.